From the incredibly warped minds at Hothead Games comes Kickin Momma, a hilarious new game coming to iPhone ($1.99) and iPad ($3.99) this August 4th. In this latest title, players control Momma as she aims and drop-kicks her babies into a shiny field of jewels and gems. Once launched into the air, Momma’s helpful children will hit, bounce and ping off pegs like pinballs. You may well ask why do these youngsters put up with this, and where are Child Protective Services? Well, in the classic cliche of overbearing mothers, Kickin Momma’s children will do anything to make her happy, including being kicked into fire, ice and explosive pegs and being booted around 36 fun-filled levels to find all the gems in the game’s 3 dynamic worlds, all because Momma wants a shiny new necklace. Players can also earn Bronze, Silver, or Gold medals upon completion of each level, as well as unlock fashionable accessory items to dress up Momma. Momma can be pimped out with costume items such as kicking boots, a mustache, a crown, and even a monocle while questing for Momma’s most-wanted prize piece: a gem-encrusted necklace. Game Center encourages masterful Mommas to compete with their friends for achievements or bragging rights to the highest place on the leader board. Prepare to kick the kids, collect the shiny gems and wear the necklace as everyone’s favourite Kickin Momma. 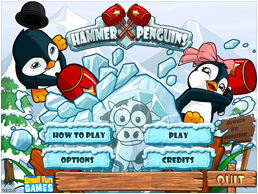 Manitoba’s Small Fun Games has released Hammer Penguins, a new Windows tile-matching game for children and adults. Similar to the Mahjonng Solitaire genre of computer games, Hammer Penguins lets you help two penguins save their animal friends who have been trapped in the ice. At the easiest levels, children of all ages will be able to pair matching tiles and release the trapped cows, puppies, and dozens of other animals from the ice. Parents can use the middle levels to play Hammer Penguins with their children, and teach them the principles of logic, strategy, and planning ahead. And a game at the high difficulty level will provide ten or twenty minutes of fun for even the most savvy gamer. Each game board is a randomly shuffled set of 140 animal tiles that you need to match, two by two, until the entire board is cleared. The theory that determines the matching rules is simple and intuitive. But the game can be extremely challenging and complex. Hammer Penguins’ infinite variety of game boards keeps you looking forward to the next game. Players can enjoy a relaxed, untimed game or the more difficult set of Challenge Games. The Hint button will reveal one move that is available immediately, even though it might not be the best strategic move to help you clear the entire board. You can even toggle the sound off if you prefer to play a quiet game. Whether you’re a home computer user who wants to spend hours of relaxing fun playing a thoughtful, non-violent game, a businessperson who needs a way to take a challenging work break to relax and unwind, or a parent who wants to teach your kids to think logically and plan ahead, Hammer Penguins can provide years of entertainment. Hammer Penguins runs under Windows 7/Vista/XP, costs $14.95(US), and may be purchased securely online. Hammer Penguins comes with a 30-day money-back guarantee. One dollar of every sale is donated to the Winnipeg Humane Society. Big Blue Bubble Inc. has announced that Burn the Rope will be setting Nintendo’s WiiWare service ablaze this month. Players can not only enjoy burning rope on their mobile devices, now they can do it from the comfort of their living room. Just sit back on the couch and play Burn the Rope on the big screen with high resolution graphics, unique motion controls, and all the fiery fun of the original game. 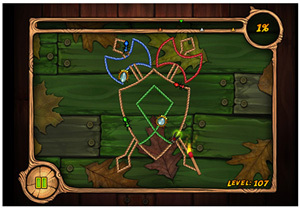 For the uninitiated, Burn the Rope is a challenging game where you try to burn as much rope as you can in each level. However, as always, there is a catch to solving these puzzles. The fire only burns upwards, leaving you to rotate the level to keep your flame alive – or at least try to. As you progress through the levels, you’ll encounter different bugs crawling along the rope, each with their own unique reactions to the flame. For example, the ant changes the color of the flame so you can burn the corresponding colored ropes, and the spider shoots out a web bridge so you can access parts of the level that you could not before. Burn the Rope is incredibly fun – and highly addictive – for players of any age. Burn The Rope will be available for 1000 Wii Points in the North American store on July 28th and the European release will follow shortly after. Burn the Rope is rated E for Everyone by the ESRB, with Mild Cartoon Violence. In celebration of the release of their new game titled Big Sticky on July 26th, Big Bad Brush has deemed that its other smash hits, Big Bad Flower, Kung Fu Master and Kung Fu Santa will be free for one week, so be sure to take advantage of this rare event and download these popular titles. Another Big Bad event that you won’t want to miss is the epic release of Big Sticky in the iTunes App Store. Featuring a purple frog prince whose bravery and heroism shines in this epic tale of love. With simple intuitive controls combined with an original gameplay experience, Sticky can propel its tongue out with only a tap to stick to objects above and swing across the screen. Using this swinging action, Sticky must get to the castle door to save the princess hidden within each level. With a total of 51 platformer puzzle levels, there’s always new obstacles and challenges to overcome. 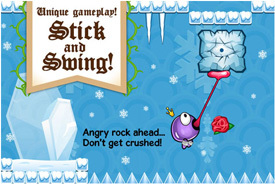 Big Sticky, will officially be available on the app store on July 26, 2011 for the iPhone, iPod and iPad, and it will be sure to enchant gamers of all ages! One of the most original new titles that has taken the game industry by storm is now available for your iPad. Sissy’s Magical Ponycorn Adventure by newcomer Cassie Creighton (and her Dad) was released earlier today on the iTunes Store for $2.99 and compatible with iPads running iOS 4.0 or later. 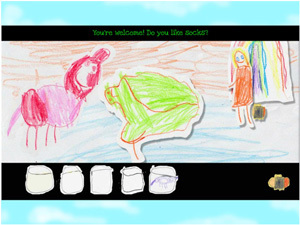 Sissy’s Magical Ponycorn Adventure began as a father-daughter project at TOJam, a Toronto-area Game Jam held in May. The game was designed in Flash and was originally released for play in web browsers, but the overwhelming success of Cassie’s game, for which she created the artwork and voice-overs, has led to additional releases for PlayBook and now the iPad. You can read the full story behind the game’s journey on Ryan’s blog over at Untold Entertainment. All of the proceeds raised from the sale of Sissy’s Magical Ponycorn Adventure are going to pay for Cassie’s education once she is old enough to attend a post-secondary school. Since launch, Cassie’s game empire has also grown to encompass Ponycorn merchandising and appearances on TV and radio, as well as in mainstream print media. For those who would like to chat first hand with Cassie’s Dad about his young game designer phenom or about Ponycorns, rainbow portals and evil lemons, Ryan will be attending Casual Connect next week in Seattle. Of course, Ryan does have his own projects he may want to discuss – but that’s outside the scope of this article, which is to send all of you iPad and PlayBook owners to the appropriate marketplaces and online stores to purchase Cassie’s game and support her education. The rich mystery and puzzle-solving fun of Big Fish Games’ Mystery Case Files™ game series soon will be available on the Wii™ console for the first time. With the June 27 launch of the Mystery Case Files™: The Malgrave Incident™ game – available exclusively for Wii – players can enjoy a mysterious adventure in their own living rooms, as well as test their sleuthing skills together with up to three friends in new multiplayer modes. Solo or as a group, players of any experience level can solve their way through a series of fun hidden-object puzzles as they uncover the secret behind the peculiar purple substance scattered across the enigmatic Malgrave Island. Mystery Case Files: The Malgrave Incident follows a wealthy recluse named Winston Malgrave who claims to have made an extraordinary discovery. His private island is home to a strange dust that may have the power to cure many of the world’s ailments. When he requests the aid of the master detective of the Mystery Case Files detective agency to help him save his beloved wife, Sarah, he opens the door into a world of shadowy intrigue and closely guarded family secrets. Is there more to this eccentric client’s case than meets the eye? Using the Wii Remote™ controller, players must explore Malgrave Island and solve multi-layered hidden-object puzzles to advance the story. They can play the main adventure on their own or cooperatively with up to three friends. For another layer of fun, players can choose from three competitive multiplayer modes: in Swift Pick, players must find certain hidden objects before their opponents do; in Tick Tick Pick, they must find a hidden object and pass the ticking time bomb to an opponent before it explodes; in Classic Pick, whoever finds the most hidden objects is the winner. Additional controllers are required for multiplayer modes and are sold separately. Each hidden-object scene in Mystery Case Files: The Malgrave Incident comes with a list of objects that players must locate. For the first time in the Mystery Case Files series, scenes have three visual layers, inviting players to scroll and zoom with the Wii Remote as they search for objects. Each scene also contains a special inventory item that allows players to access new areas of Malgrave Island and solve additional puzzles. An on-screen hint button can also be used to highlight the area around hard-to-find objects. Big Blue Bubble, Inc. has burned its way onto Android with their smash hit Burn the Rope, which is finally available on Android Market. A critically-acclaimed best seller, Burn the Rope is a puzzle adventure where the goal is as simple as it is addictive: burn as much rope as possible. I can attest to this – the game is incredibly addictive and has a very high replayability factor. Release your inner arsonist and ignite your way through over 100 delightful levels, with new user generated puzzles every day. Get involved and submit your very own puzzle to be featured in Puzzle of the Day. In Burn the Rope users have the freedom to set fire without any fire hazard or need for a fire extinguisher. The game involves a mix of strategic planning, thinking ahead, coordination and the ability to stay in deep focus. Users have to feed the fire and burn as much rope as they can in each level to progress. The challenge is that fire only burns upwards, leaving players to tilt and turn their iPhones to keep the flame alive. The game features 116 devilishly tricky levels with polished graphics and mesmerizing fire effects. Bugs that crawl along the rope spice things up demonstrating different reactions to the flame from level to level. Ants change the color of the flame so that users could burn different colored ropes, and the spider shoots out a web bridge providing access to the parts of the level that were beyond players’ reach before. Burn The Rope is also available on Ovi for Nokia phones, the iTunes App for mobile iOS devices and in the Mac Store. 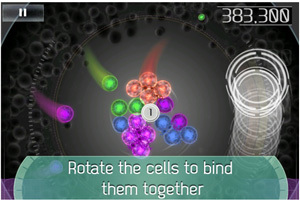 Cell Bound, the latest iOS device game from Hothead Games is available now in the iTunes App Store, and for just 99 cents, you can pick up a simple and addictive puzzle matching game that players in control of an important piece of science equipment – a sterile culture dish. Unfortunately, as soon as the dish is in the player’s hands it is subjected to contamination from a constant bombardment of colored cell structures. To save the scientific sample, players have to spin the dish around using on-screen controls, catching and matching different colored cell structures as they drop into the field of play. Link five or more of the same color and cause the cells to burst and vanish before they can contaminate the whole dish. Burst more chains at a faster rate to score more points. Infinite Mode: The main mode, colored cells drop towards the center and explode when 5 like colors are connected. All of the cells can be burst using the smart bomb trigger in the center of the dish. More smart bombs can be accrued by racking up points. Timer Mode: Gain as many points as possible in 1:30 minutes. There are no smart bombs, and for every 1,200 points, one more second is added to the timer. Burst Mode: Cells that connect and are not the same color turn black and inert, obstructing the new cells. Cell Bound is rated 4+ and is compatible with iPhone, iPod touch, and iPad devices running iOS 3.1.3 or later. New Brunswick indie studio On The Fly Entertainment has announced the launch of the studio’s first Xbox Live Indie Games release, math-based puzzle fighter Sum Fighter. Choose from one of six high school archetypes, use their unique abilities to bury your opponents and rise to the top of the school math competition. To crush your opponent, rapidly add numbers to destroy blocks on your board and drop them into your opponent’s board. To destroy your blocks, you must drag adjacent blocks together, combining their face values. Once you’ve connected as many groups together as their face value the blocks disappear (players would connect five groups of the value 5 to destroy them or two groups of the value 2 and so on). The first player whose blocks reach and stay at the top for ten seconds loses. Our narrated tutorial steps the player through our mechanics before their first match. Each character has their own path through story mode with their own unique character interactions and ending. The Jock, Nerd, Emo, Tagger, Principal and Librarian each have a unique ability they can unleash on their opponent, in order to be crowned the Sum Fighter Champion! Sum Fighter is available now on Xbox Live Indie Games for 240 Microsoft Points. Independent development studio Chaotic Box has launched its latest mobile game title to the iTunes Store. Match Panic challenges the tap skills of iOS gamers as they race to beat the clock and level up in order to increase their score multiplier as they tap madly to match the game pieces. Power-ups help blast players through each challenge to the next level, each more difficult than the previous. Unlock a dozen cute pixel characters and compete with friends on 5 Game Center Leaderboards. For the ultimate player challenge, there are 9 Game Centre Achievements for the taking. Match Panic is available for 99 cents USD and is rated 4+. 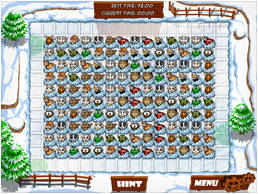 This game is compatible with iPhone, iPod touch, and iPad devices running iOS 3.1.3 or later.